Las Vegas karaoke is a breed of its own and when you are visiting Sin City you will be pleased with the wide variety of places where you can belt out your favorite song. There are plenty of options for everyone that either want to sing in public or just with their friends. Private rooms that are ideal for a group of friends can be found at Karaoke Q Studio, J Karaoke, GoGo Karaoke, Ganzy Karaoke and Zizzy Bar and Karaoke. If you like to be in the forefront of everyone in the bar then you should try Dino’s, E-String Poker Bar or Champagne’s and the Aloha Kitchen & Bar has several superb locations as well as a family atmosphere. No matter what language you speak, most of the karaoke bars feature lyrics in numerous languages and most boast a delectable menu of goodies to munch on while you sing and party. One of the best spots for Las Vegas karaoke that combines good food, an extensive playlist and private rooms is Karaoke Q Studio. Located on South Jones Boulevard in China town, Karaoke Q Studio has an upbeat younger atmosphere with a decor that features plush couches and plenty of video screens as well as multimedia effects. The karaoke bar has numerous private rooms that are perfect for groups of people from three to 25 guests. Each room has a different feel with plenty of laser lights and disco balls to make you feel like the real singing star. The playlist includes old and new songs as well as everything in between. While you are indulging in some great cocktails, you can dine on a variety of Asian dishes which are expertly prepared. Happy hour is the best time to go with discounts on room rates as well as a plethora of drink specials. The Aloha Kitchen & Bar is a perfect place for Las Vegas karaoke for people of all ages who want to have some fun singing along with the friends. There are several locations throughout Sin City and the closest to the Strip is located on South Decatur Boulevard just off of West Sahara Avenue. 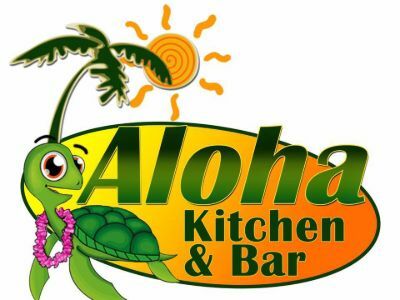 You will be thrilled with the playlist and the upbeat family atmosphere you will find at the Aloha Kitchen & Bar. The interior has a modern industrial look with a little bit of the Hawaiian Islands thrown in for fun. Karaoke is available at each location and you can sing for free with a two drink minimum which will save some money. There are several quality video screens to assist you in impressing your friends with your voice. The menu at the establishment is ideal too with Polynesian, Asian and American cuisine that is a great way to compliment your karaoke skills. Address: 3899 Spring Mountain rd. In every city karaoke is a little different and experiencing Las Vegas karaoke at the GoGo Karaoke Room is a superb idea. Located along South Maryland Parkway, GoGo Karaoke has a lively atmosphere with a push industrial interior that is usually packed with party goers. The establishment features several private rooms for karaoke that can hold groups of people from four to more than 25 guests. The interior of the karaoke rooms is quite different with plush couches and tables for comfort while you view big screens spelling out your next song to sing. The playlist is extensive and the bar boasts more than 10,000 titles for you to choose from while you hold the microphone in your hand. When you get hungry, there is a great food menu with Asian as well as American cuisine and you can indulge in some fantastic Korean Soju when you get thirsty. Dino’s Lounge is a premier place for people looking for an exciting evening of Las Vegas karaoke. 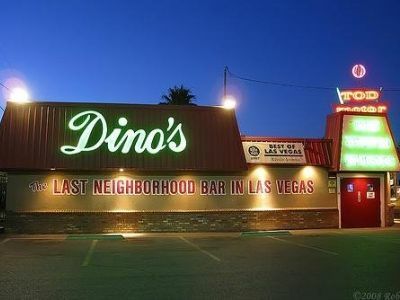 Located along South Las Vegas Boulevard, Dino’s Lounge has been around for more than 50 years and features a true dive bar atmosphere of fun as well as cheap drinks. Once inside you will notice nothing special with the decor and a lack of lighting but everyone will be having a good time. Known as “The Last Neighborhood Bar in Las Vegas” the place is hopping with fantastic karaoke when singing parties are hosted by numerous DJs that keep the movement of the microphone moving from patron to patron. There are plenty of good drink specials during throughout the night as well as a happy hour that will please everyone. An added bonus at this dive bar is the electronic gaming machines, pool tables and slot machines you can play while listening to the best karaoke in Sin City. A fabulous place for Las Vegas karaoke where you will find a no nonsense attitude and great playlist is E-String Poker Bar. 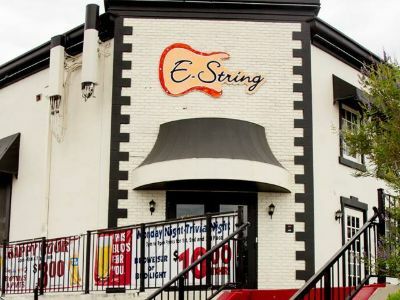 Located along West Sunset Road in Henderson, E-String Poker Bar has a lively atmosphere with a modern industrial interior that is open 24-hours every day of the week. This bar is loaded with plenty of excitement for you to enjoy that ranges from karaoke to electronic gaming machines to live music on selected nights. You will find karaoke starting at 9:00 p.m. each night of the week and there are plenty of drink specials even after happy hour is over. The crowd at this establishment is mainly local with a few tourists sprinkled in for fun. The playlist of songs for karaoke is extensive and you will have no problem finding your favorite tune to sing for the crowd. If you get hungry while singing along to your favorite songs, there is a kitchen serving a variety of American cuisine. 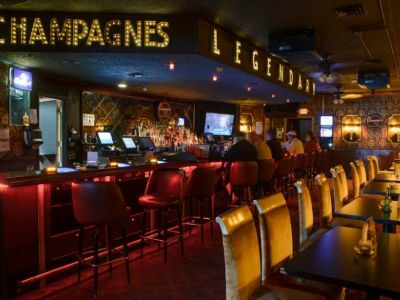 Las Vegas karaoke is an experience all to its own and a perfect place to enjoy an evening of singing with your friend is Champagne’s. Located along South Maryland Parkway, Champagne’s recently went through a transformation while participating on Spike TV’s Bar Rescue. The interior of the establishment is cozy with a retro decor that features the original velvet wallpaper, arched booths and newer comfortable gold colored seating options. The bar has been a main staple in Las Vegas for years and is considered one of the best dive bars you can visit while in Sin City. They offer karaoke on numerous nights that is highlighted by DJs playing everything from classic hits to EDM. The bar has an old school feel that is excellent for relaxing in an unpretentious atmosphere loaded with lots of people singing their favorite songs from an extensive playlist. 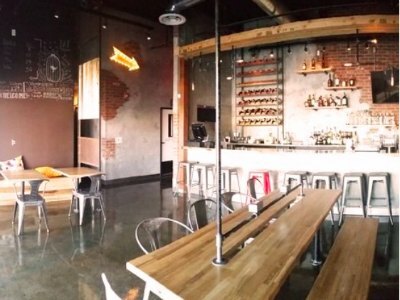 Reasonable drink prices are a plus and happy hour will knock your socks off. If you are searching for a great place to enjoy Las Vegas karaoke, then you should try Ganzy Karaoke. 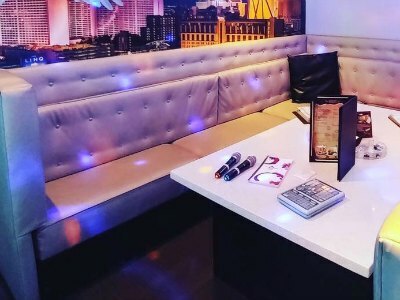 Located along South Rainbow Boulevard, Ganzy Karaoke has a high tech feeling with an interior that boasts nice comfortable booths and benches. 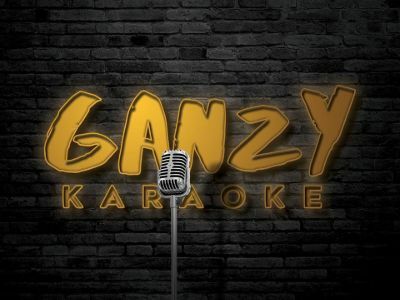 While you are at Ganzy Karaoke, you will be thrilled with the playlist of songs that range from classic hits to KPop to contemporary music that everyone loves. 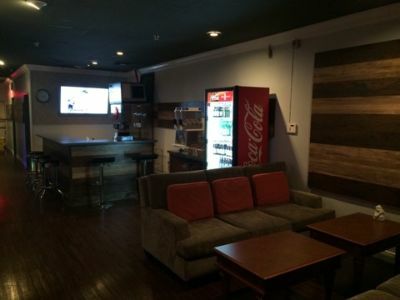 There are several rooms that you can rent whether you are a small or large group. The multimedia effects are superb with plenty of disco balls and laser lights shining off the walls and tables. Happy hour is particularly good here and you will find plenty of drink specials. Another bonus is the bar stays open until 5:00 a.m. which is ideal for late night people looking for entertainment and a fun time. Ninja Karaoke is one of the hottest places to visit for all types of people who are interested in the uniqueness of Las Vegas karaoke. Located along South Main Street in the Las Vegas Arts District, Ninja Karaoke brings a ton of energy to karaoke from a great song list to drink specials at the bar. Once inside Ninja Karaoke you will be surprised at the atmosphere which changes in every karaoke room that is on premise. The establishment has nine different karaoke rooms that can be rented by groups of friends from five to twenty guests. The rooms have a different decor that ranges from chic, industrial and everything in between. The 6,000 square foot facility dedicates 2,000 square to the bar area, lounge space and the karaoke rooms. The karaoke rooms are fabulous with a variety of themes and they can even be rented by families with children for the ultimate family experience. 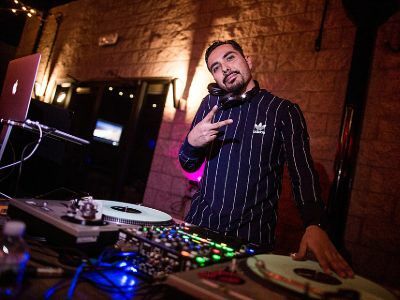 There is also a stylish outdoor patio which is hit for people looking for great party atmosphere that is perfect for mingling while dancing to the music several DJs will spin throughout the night.